Explore miles of beautiful and varied scenery, excellent wildlife viewing opportunities, and several canoe-in campsites along the way. 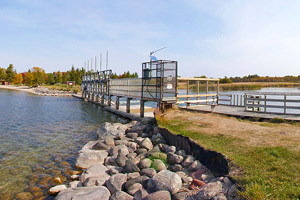 After leaving the headwaters of the Mississippi River, the first public water access outside Itasca State Park is Gulsvig Landing at State Highway 200. Wanagan Landing is the first campground and rest area on the river. 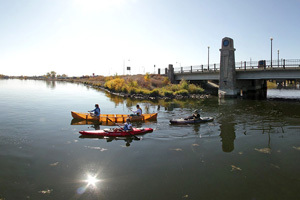 Seasonal water levels through this section may hinder your trip, as paddlers in the summer and fall often must drag canoes or kayaks for distances of up to a half mile. 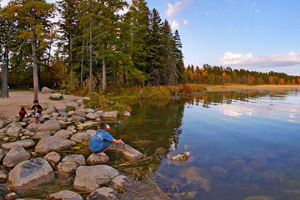 It is advisable to check the river level gauges on the DNR website or call Itasca State Park or the Parks and Trails Area Office in Bemidji for detailed water levels and river conditions. This metal bridge over the Mississippi River leads to a canoe campsite and Adirondack-style shelter. 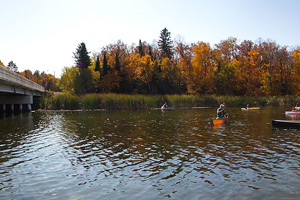 The campsite is a popular layover for first day paddlers arriving from the headwaters. A privy, fire ring, and picnic table are available. La Salle Creek enters the Mississippi River a short distance downstream. Soon after leaving the rest area, the river abuts the La Salle SNA on the river right. 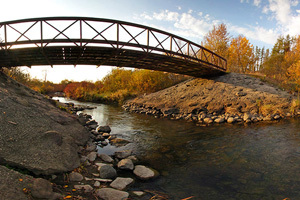 This section of river can be a challenge to navigate. It has a wide flood plain and floating bogs that can cause changes to river channels. Late season travel in this stretch (after vegetation emerges) can be especially difficult. The campsite (seen here) was affected by the July 2012 wind storm. As a result of extensive timber damage, the campsite area had to be logged and replanted. This is the first chance for paddlers to encounter dry ground and a campsite after departing a massive winding floodplain with numerous oxbows. Make notes in your journal as you watch the incredible sunsets from this campsite. For those who wish to get off the river for the day, a take-out point at Hubbard County Highway 7 is less than a mile downstream from the campsite. This take-out has a new, adjacent cement bridge, but be sure to watch for evidence along the river of the old “iron” bridge river crossing between the campsite and new bridge. Prior to entering Lake Irving, the Schoolcraft River enters the Mississippi River on your right. 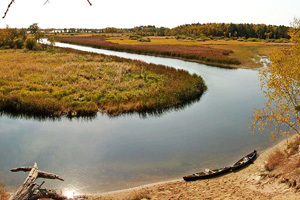 After paddling under numerous bridges between Lake Irving and Lake Bemidji, you will enter Lake Bemidji. Paddle to the left and enter the home of Paul Bunyan and Babe the Blue Ox at the Bemidji tourist and information center. Plan your crossing of Lake Bemidji carefully; when the wind picks up, this stretch can be difficult. From this point downstream, the channel widens and you may encounter more motorized boat traffic. 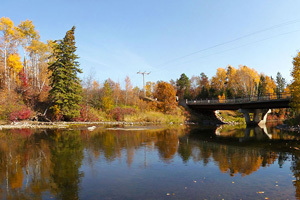 As you exit Lake Bemidji, you will cross over a historic railroad trestle that is now the Paul Bunyan State Trail. Water depths in this stretch allow paddling for a good portion of the year. A couple miles downstream the river widens as you enter Stump Lake, a direct result of the construction of the power dam. Use caution and stay well clear when approaching the dam. Watch for the portage on your river right. This view is immediately downstream of the power dam and was historically used as a fish hatchery site. From here, you may encounter shallow water and slightly exposed or submerged rocks. Typically, you will see many fish in this shallow section of the river. This section becomes less urban and has many scenic views. This site is not a day-use area, but rather a portage allowed on private property. Watch closely for the sign marking the river landing on your left. Constructed steps are available near the sign. 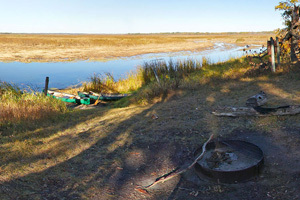 This site looks upstream at an island for which the site derived its name. This site is very private and is accessible only by water. If you are willing to climb the steep bank, your reward will be a wonderful view of the river channel with Wolf Lake in the distance. This location offers the opportunity to rest (after climbing the banks) with a scenic view. No formal amenities are provided. After High Banks, you will encounter more power boats as fishing is popular in Wolf Lake, the river, and eventually Lake Andrusia and Cass Lake. 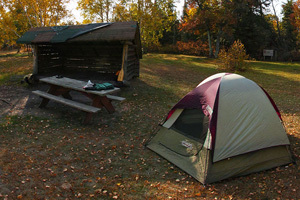 This is a U.S. Forest Service campground and day-use area that offers drinking water, restrooms, and vehicle access. Pick your crossing of Cass Lake carefully, as this lake crossing can develop treacherous waves. If time allows before reaching this site, Star Island offers camping, hiking, swimming, and other recreational opportunities. Star Island contains Windigo Lake. 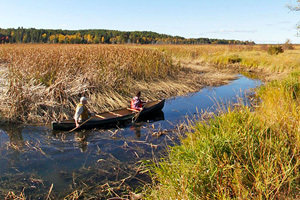 Take a short portage and experience this unique lake, within an island, within a lake.